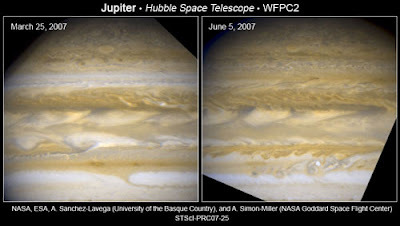 These pictures of Jupiter's clouds were taken by the Hubble Space Telescope (HST). It has captured a dramatic change in the upper equatorial band of Jupiter. It appears to have disappeared and merged with the darker bands. Something is going on in Jupiter's atmosphere that we can only guess on. The two white stripes of Jupiter had always been a favorite sight to see by amateur astronomers using their small-aperture telescopes.